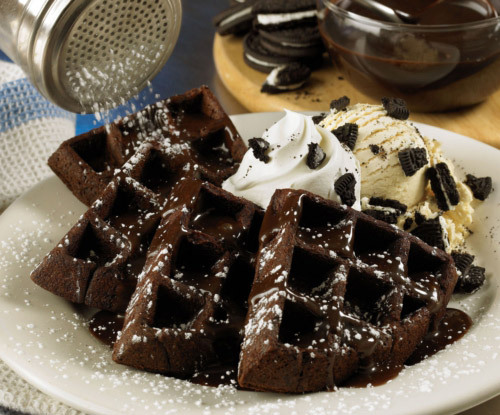 For a limited time, Outback Steakhouse® will offer OREO® Cookies 'N Cream Waffles dessert which features warm chocolate waffle cakes with vanilla ice cream, OREO® cookie crumbs, whipped cream, and house made chocolate sauce. To find a location near you or for more information about Outback Steakhouse, please visit www.Outback.com, www.facebook.com/outback or follow us on Twitter @Outback. Outback Steakhouse was once again voted #1 Best Steak in the 2011 Zagat Survey® of National Full-Service Restaurant Chains for the third consecutive year. Outback Steakhouse starts fresh every day to create the flavors that our mates crave. Best known for grilled steaks, chicken and seafood, Outback also offers a wide variety of crisp salads and freshly made soups and sides. New creations and grilled classics are made from scratch daily using only the highest quality ingredients sourced from around the world. For more information, please visit www.outback.com or http://www.facebook.com/outback. OREO® is a registered trademark of Kraft Foods Global Brands, LLC; Monin® is a registered trademark of Monin, Inc; Absolut® is a registered trademark of V&S Vin&Spirit AB; Kahlua® is a registered trademark of Pernod Ricard USA, LLC; Bailey's® is a registered trademark of R&A Bailey & Co; 100% Blue Agave El Jimador® Reposado Tequila is a registered trademark of Brown-Forman Corporation. I had this last week and it was pretty good. They have good vanilla ice cream and the Oreo pieces also had the cream with them, compared to just the chocolate wafers.